Rich McInnis of the EHS class of 1961 discovered that the first person buried in the Rialto Cemetery was a young man named John Stewart who drowned in December 1901 in Urbita Hot Springs in San Bernardino, This got Rich Interested in Urbita Hot Springs. The former location of Urbita Springs was just west of E. Street and South of Mill Street where the Inland Center Shopping Center was built in 1966. Urbita Hot Springs was a very popular place to go during the early part of the 20th century. Rich was telling me the other day that he learned from looking through the records of the San Bernardino County Coroner that at least 8 people drowned over the years in the lake at Urbita Springs. 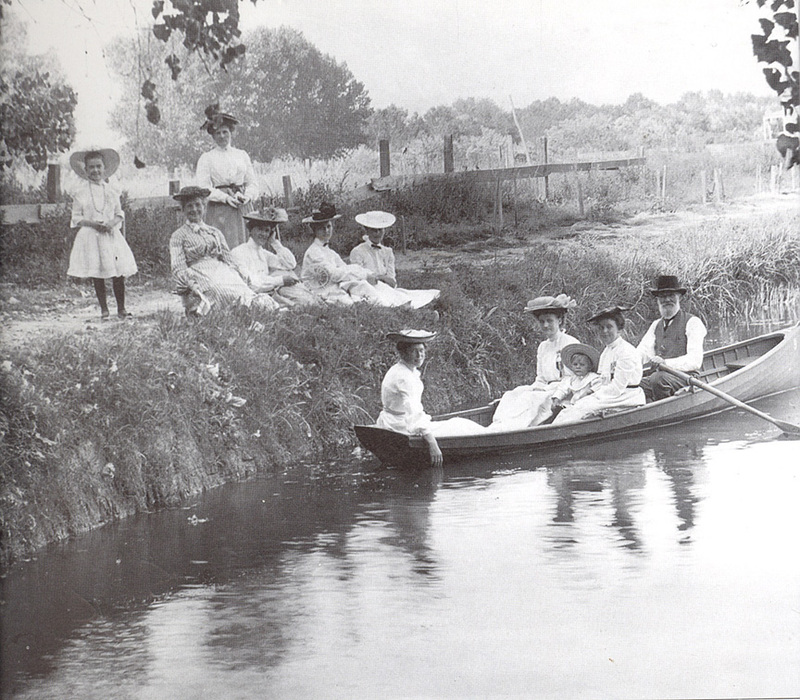 The first attached photo shows the lake along with some boaters. This photo comes from Nick Cataldo's excellent photo history of San Bernardino published by Arcadia Publishing Co. 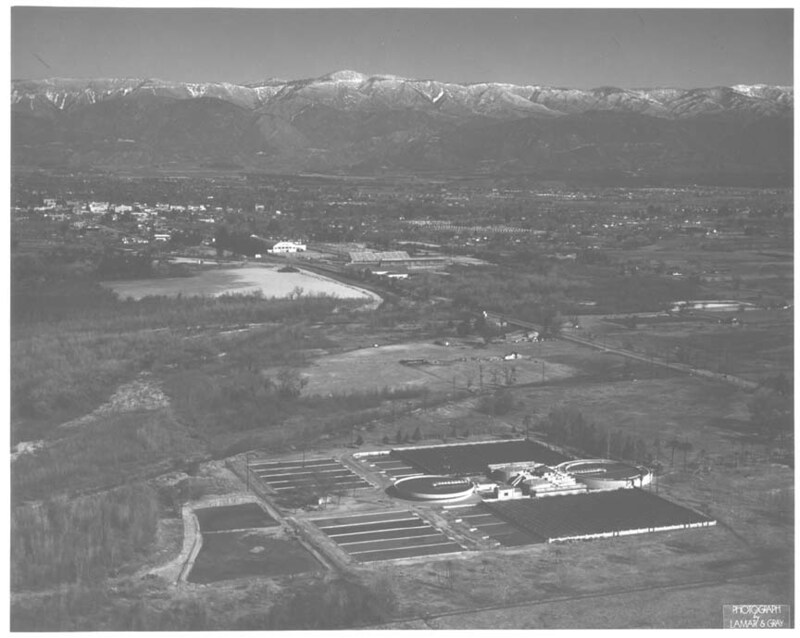 The second attached photo, an aerial photo lookng towrd the north from the south end of San Bernardino, shows the site of Urbita Springs in 1946 when the lake had dried up. At the bottom of the photo is a water treatment plant and to the right of that facility, angling toward the left as it moves up the photo, is E Street. About half way up the photo just to the left of E Street is a light colored area that was the former site of Urbita Hot Spings. A bit farther north, just to the right of E Street, you can see the stands for the Orange Show racetrack and still farther north is the enormous orange show building that burned in 1949. The two photos will be uploaded into Rialto in the 50s and 60s in the Rialto50and60s group site. Below is a short history that Rich McInnis sent about Urbita Hot Springs. The local Indians have used the hot springs around the San Bernardino valley for many years before “white” men settled the valley. One set of springs became known as Midway Springs because they were located “midway” between San Bernardino and Colton. In 1901 a 15-acre area around the springs, including a lake, was developed R. Paragette. He renamed the development Urbita Hot Springs and built bathhouses and shuttled patrons to and from the site by automobile. Later the springs were taken over by the San Bernardino Valley Traction Company. The Traction Company was a local trolley system. They built two lines to the springs to bring customers to the park. The park had, besides the lake, a water slide, bandstand, pavilion, aviary, zoo (with monkeys, llamas, snakes and other animals) and amusement rides. In 1903 the lake was enlarged to “more than a mile in circumference” and the park expanded to 34-acres. However, a dam built to hold the enlarged lake broke and some flooding occurred. The lake had to be drained and the dam rebuilt. By this time the lake also had an island connected to the shore by a wooden footbridge. In 1905, two thousand spectators witnessed a near tragedy Urbita Springs when “Professor” Grant Morton attempted to ride a hot air balloon to and altitude of 2,000 feet and then parachute to the ground. This is a feat he had performed a number of time, but this time, his arm became tangled in the tether line to the balloon and he was dragged through some trees, and was finally save only when he got caught on a barbed-wire fence. He broke his arm, but returned in 1906 to successfully perform the stunt. In 1910, when the Pacific Electric Railway acquired the San Bernardino Valley Traction Company they also gained ownership of Urbita Hot Springs. The Hot Springs was a very successful operation with families riding the Red Cars from as far away as Long Beach and Los Angeles. From 1922 to 1924 the National Orange Show was held at Uribta Hot Springs. They operation of the springs until 1924 when they sold the park to Ernest Pickering. Pickering changed the name to Pickering Park and operated it for a number of years, until the falling water table and the depression changed it into a forgotten muddy swamp. In 1943 San Bernardino Jeweler Albert Arthur and real estate broker H. B. Estes bought the 34-arce park. They planned to develop the springs into its former glory, including redevelopment of the lake, a swimming pool and other attractions. The ballroom was completely restored and they began a weekly series of dance programs. The “Grand Opening” performance on December 15, 1943 was by Horace Heidt and his Musical Knights. An advertisement for the grand opening indicated there was “FREE PARKING for 1000 CARS” and listed the following Urbita Springs Ballroom Policy: Positively no zoot suits or drape trousers. Gentlemen must wear coat and tie. The wearing of sweaters will not be permitted. It is the wish of the management to make Urbita Springs Ballroom a place where LADIES and GENTLEMEN can go for an evening of high-class entertainment, clean fun and enjoyment, in a distinctive environment. Other big band headliners played at the Urbita Ballroom. Harry James was there in 1944 and Bob Crosby appeared in 1946. The other attractions were never built and, although dance bands continued until the 1950s, Urbita Springs never regained the popularity of the past. In 1966 the site became the Inland Center Mall which is still in operation today. An advertisement for Urbita Springs Park Ballroom in The San Bernardino Daily Sun, December 15, 1943, Page 4 and an article about the dance hall in the same paper. Chapter 14, Uribita Springs, from “Tractions of the Orange Empire” by I. L. Swett, copyright 1967. Postcard from the Empire by Mark Muckenfuss, The San Bernardino Sun, November 20, 1998, Page D-1.